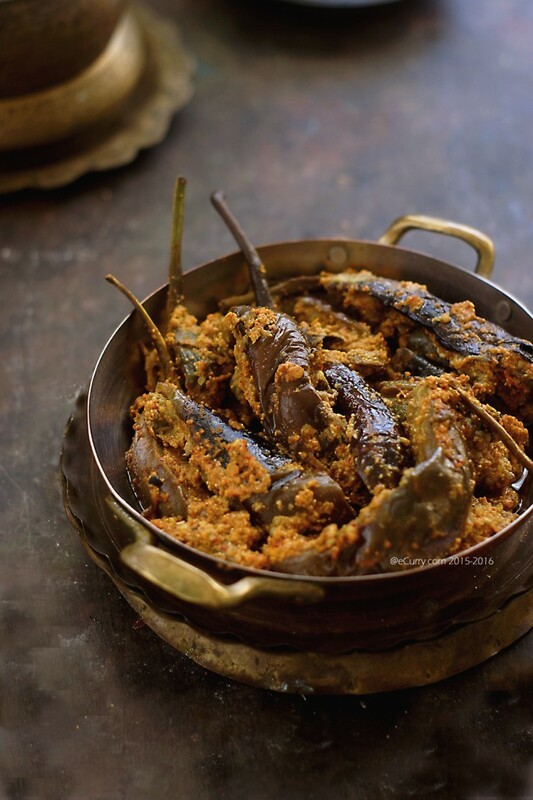 This is another traditional Bengali recipe. 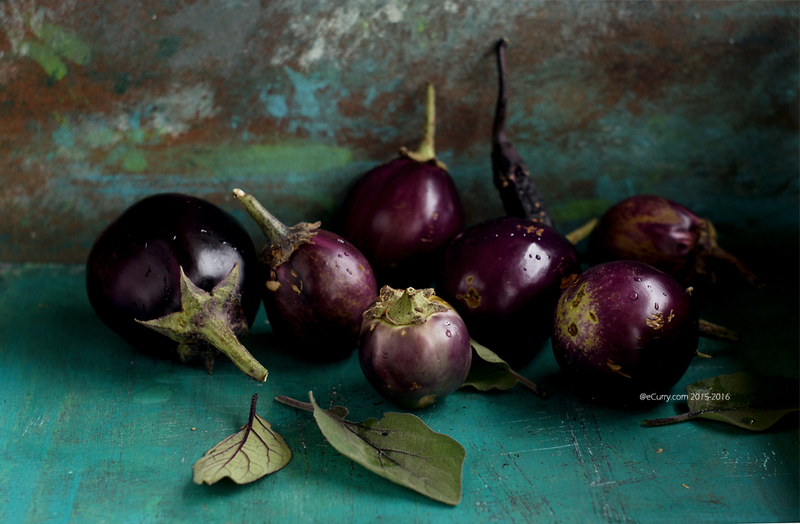 Eggplants are lightly sauteed and then cooked in the creamy poppy seed paste. It is amazingly simple and flavorful. This happens to be one of those dishes where no spices are required. Even though this is meant to be an everyday sort of dish, I have no recollections of having this in my home except for a few times. Summer has been long gone. 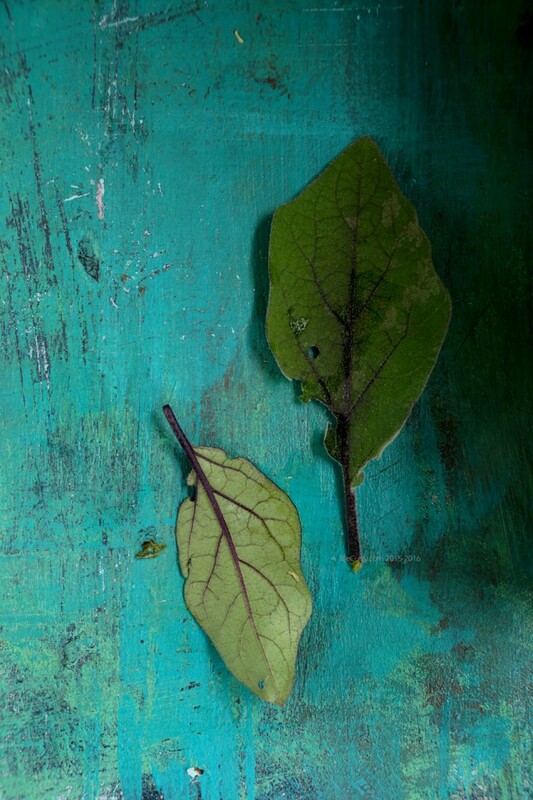 What remains are the skeletons of the plants that used to be lush and fruitful. They have given all they could offer, until the last day when the sudden frost came and nipped their strength. A few times during the warmer months, I have had so much eggplants in a day from our yard, that we did not know what to do with them. We were eating them for days and I was trying to do something different each time so boredom does not set in. However eggplant is such a thing that does not spell boredom. There is so much to it – the meaty yet tender texture, the flexibility it allows to absorb the flavors of anything added to it, all of it allows a variety of recipes that it can be used in. You can tell that we are a family of eggplant lovers from all the eggplant recipes I have posted so far in the blog (all of them listed after the recipe). Poppy seeds, the white ones, are a big part of Bengali cuisine. 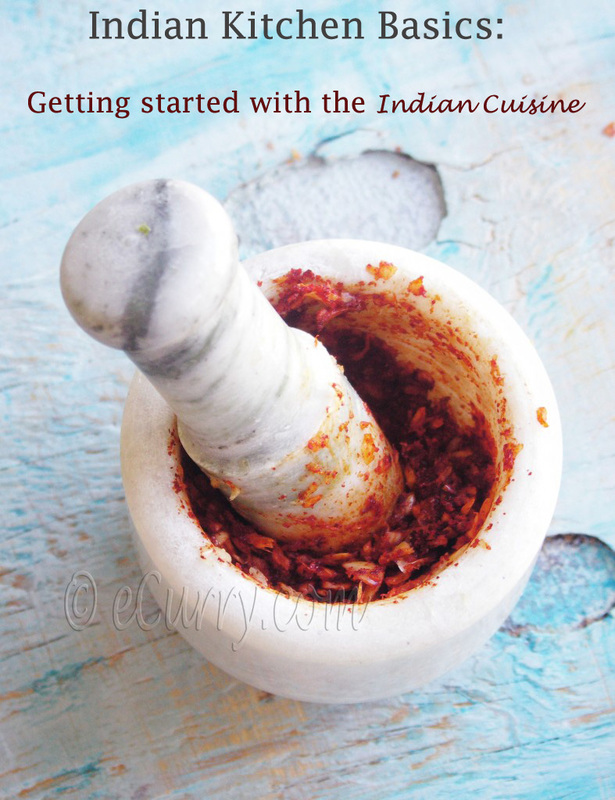 It is used not just to make creamy sauces for curries, but also used just by itself as a side dish as in the recipe here. 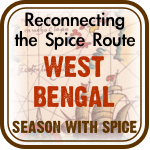 I could be very much biased being a Bengali myself and growing up on many everyday recipes using poppy seeds, and learning to love them. Or maybe I am plain addicted. Poppy seeds after all can cause addiction. 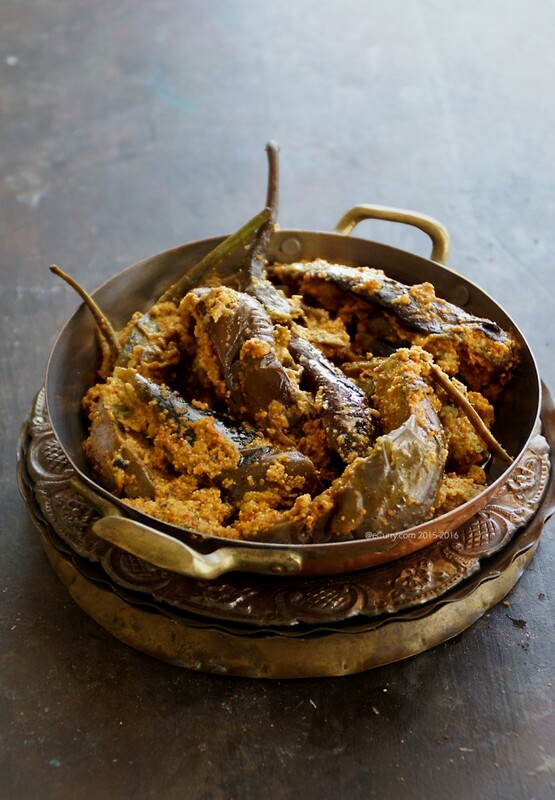 The three simple ingredients: eggplant, posto or poppy seeds and pure golden mustard oil and you are ready to create this dish. Slice the eggplants whatever way you want and sprinkle salt and turmeric on them. Rub them in and allow them to sit for a while. make the poppy seed and chili paste. 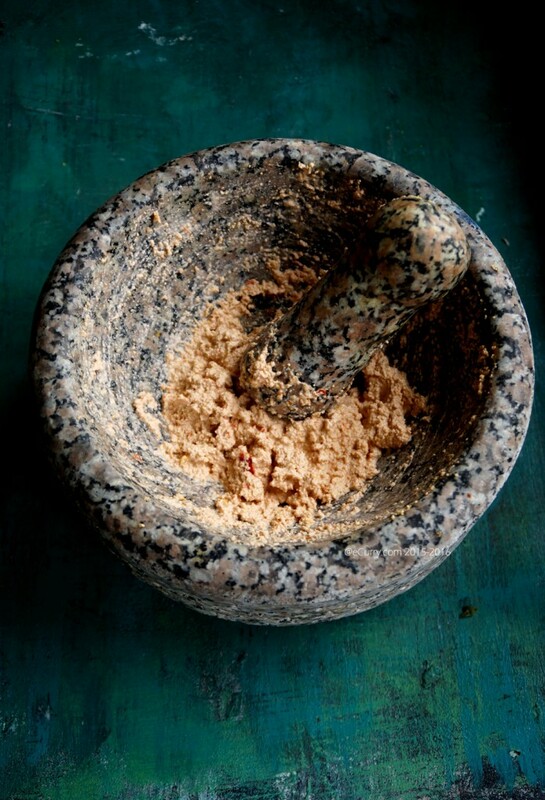 mortar and pestle or the traditional grinding stone or the shil nora does a perfect job. 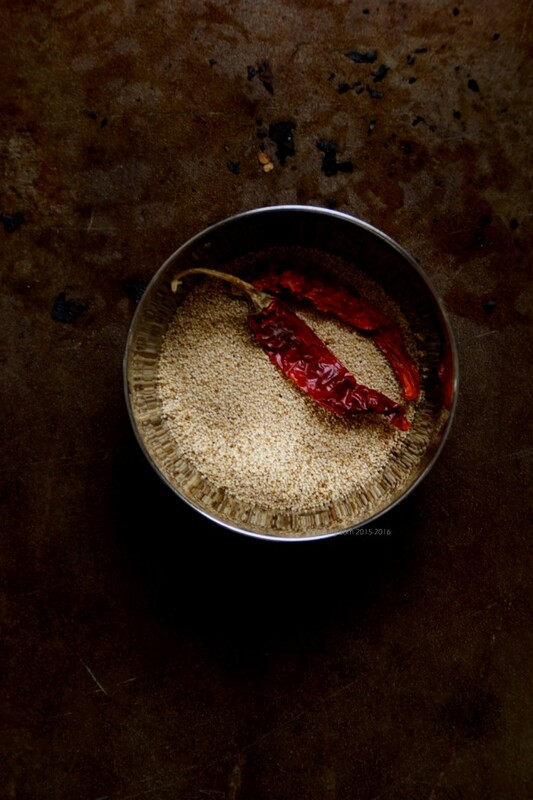 Wash the poppy seeds in a sieve/strainer and soak them with the dry red chilli peppers for about an hour. Soaking makes grinding the seeds easier. Slice/chop the eggplants in cubes or strips. 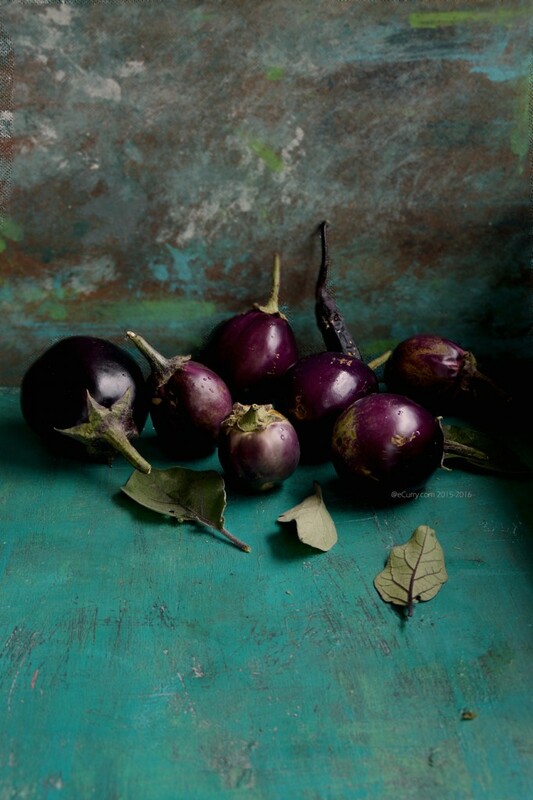 If you are using small round eggplants, you may slit them in fours, keeping the stem intact instead of chopping them. Sprinkle half of the turmeric powder and some salt, toss and allow them to sit for about 15 – 20 minutes. Strain out the poppy seeds and the peppers and grind them together in a thick paste. 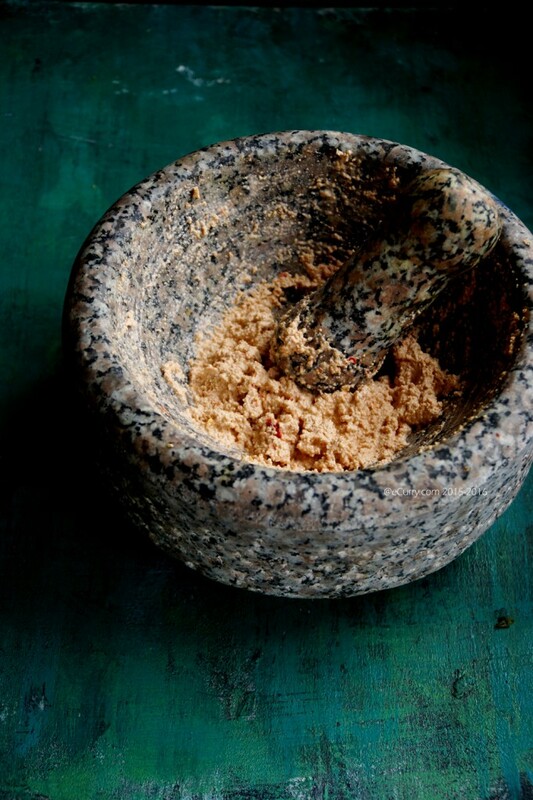 I use my granite mortar and pestle and hand grinding allows me have control over how much water I will use. Try NOT to make a watery mix. Heat oil in a pan. If you are using nigella/kalonji to temper (this adds a very typical flavor) add them to the oil now along with the slit green chilli pepper. If you are not using the nigella, simply add the chilli pepper and allow it to have brown spots. Now add the eggplants and the rest of the turmeric to the pan (discard the liquid it releases while it sat bathing in turmeric and salt). Cook them at medium heat until the skin turns a darker shade and the oil coats the pieces – about 6-8 minutes. They would have softened a bit. Now add the poppy seeds and chilli paste to the pan and quickly toss for the paste to be combined with the eggplants. Sprinkle salt and cook uncovered for a couple of minutes. Cover, lower the heat and cook until the eggplants soften. You can uncover and toss a couple of times while it cooks. The cooking time will depend on how fast the eggplants cook. If during the cooking process the water dries out, add a little water. However if you are using a tight cover, it should cook in its own steam. 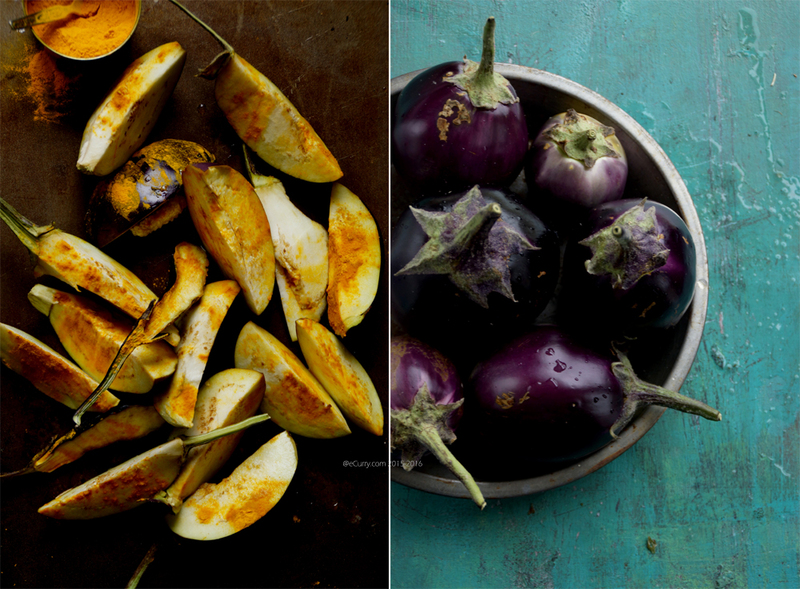 Once the eggplants are softened, drizzle the tablespoon of mustard oil and gently toss. Adjust salt. There should be no liquid left. The eggplants would be tender but not mushed. The poppy seed paste would coat and hug the eggplant pieces. If you want more sauce you may add a little water and simmer it further, for a few more minutes. 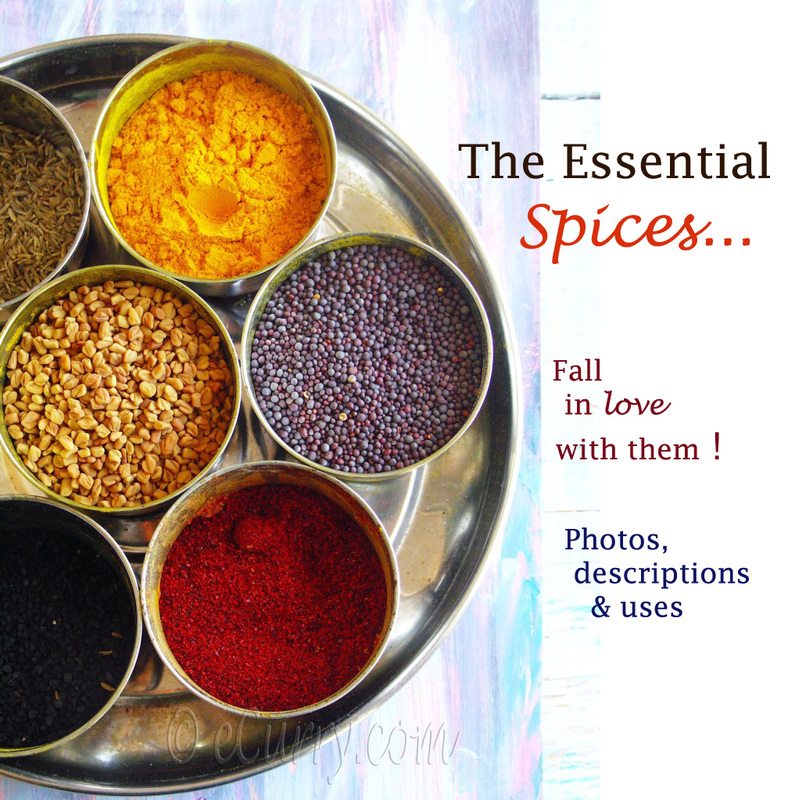 Serve hot with flatbreads or over rice or as any side dish. 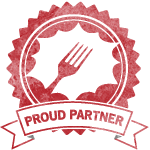 January 26th, 2015 | Category: Dry Fries, Sides & etc. A fabulous dish. 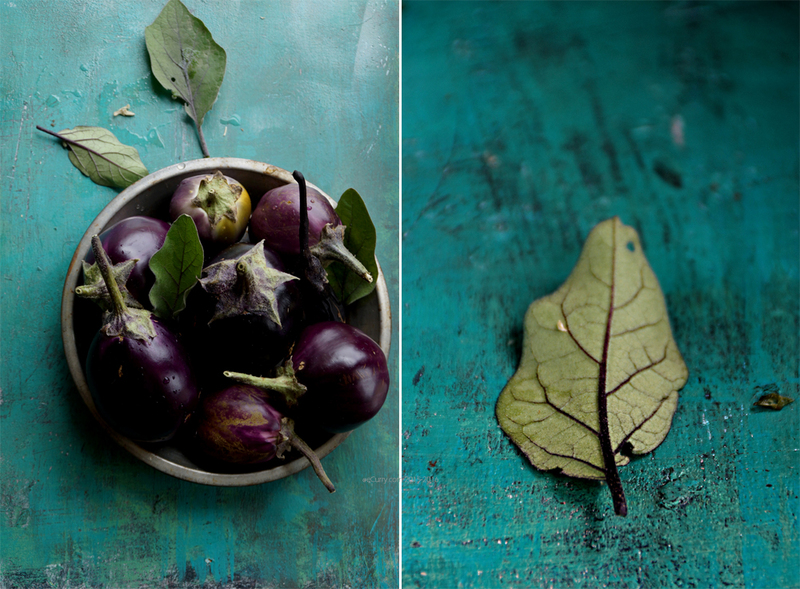 This is something I’ll have to try next summer… I love that first shot of the eggplants. a ha…ki yummy…mone hocchey, ek plate gorom bhat kheye pheli…. Loved the pictures. This is one of my favorite dishes cooked with eggplants. A little extra drizzle of raw mustard oil gives it a kick too. I am dying to eat this Begun Posto. 1) Posto is banned in Dubai. 2) I have had it cooked in a different way – eggplants cut in small cubes and then cooked. The colour of the canvas is looking so so good. 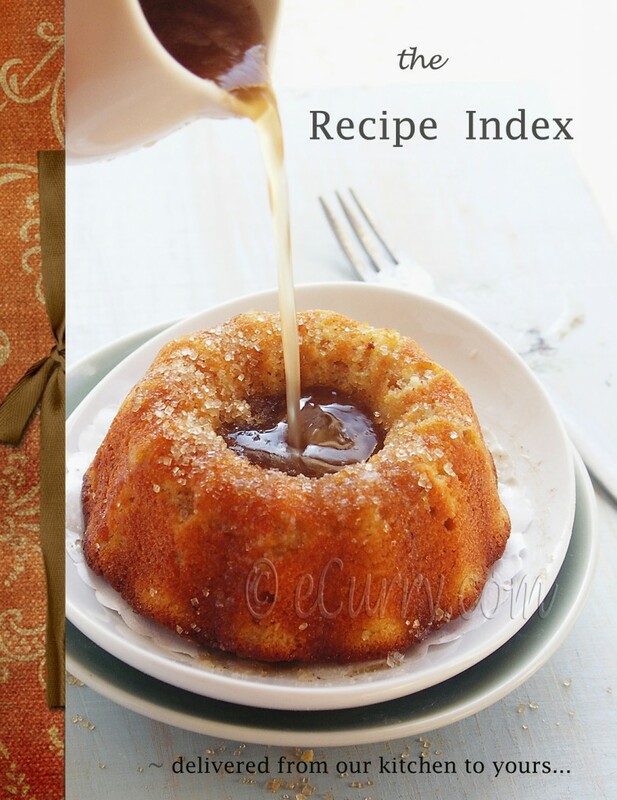 Love the recipe and your pictures. There is so soothing light in all of you photographs.